Thursday January 31 1907 I did the ironing in forenoon and got the dinner Will puts in a good deal of time working with the cow he went to town in afternoon to get something to put on the bag it is so swollen. 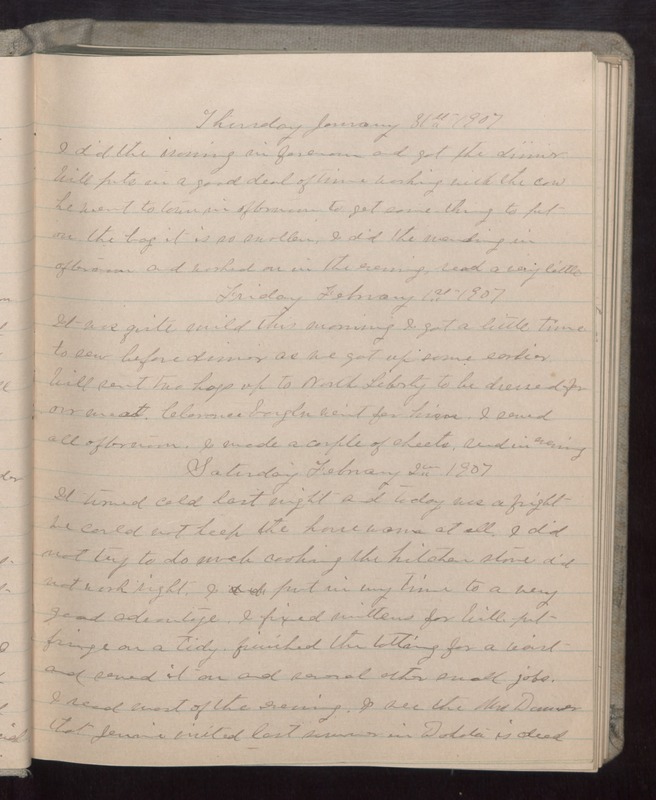 I did the mending in afternoon and worked on in the evening read a very little Friday February 1st 1907 It was quite mild this morning I got a little time to sew before dinner as we got up some earlier Will sent the hogs up to North Liberty to be dressed for our meat. Clarence Vaughn went for him. I sewed all afternoon. I made a couple of sheets, read in evening Saturday February 2 1907 It turned cold last night and today was a fright we could not keep the house warm at all. I did not try to do much cooking the kitchen stove did not work right. I put in my time to a very good advantage. I fixed mittens for Will, put fringe on a tidy, finished the tatting for a waist and sewed it on and several other small jobs. I read most of the evening. I see the Mrs [Dammer?] that Jennie visited last summer in Dakota is dead.